We're barely into February and I'm already gearing up for spring skincare. I'm always looking for products to amp up my skincare routine and keep my skin looking fresh, even with the most minimal makeup. The Mineral Fusion Brightening Eye Cream has SPF 16 in an ultra-light formula so it's perfect for daytime wear on its own or under makeup. Benefits | This eye cream is packed with skin-loving ingredients such as Vitamin C, Rosehip Oil, Avocado Butter, antioxidants and SPF. Vitamin C helps to even skin tone while Rosehip Oil and Avocado Butter work to keep skin hydrated and minimize the appearance of fine lines. It also has antioxidants which help promote firmness and more youthful skin. The SPF 16 is essential for protection against the sun especially as we look toward spring and summer. 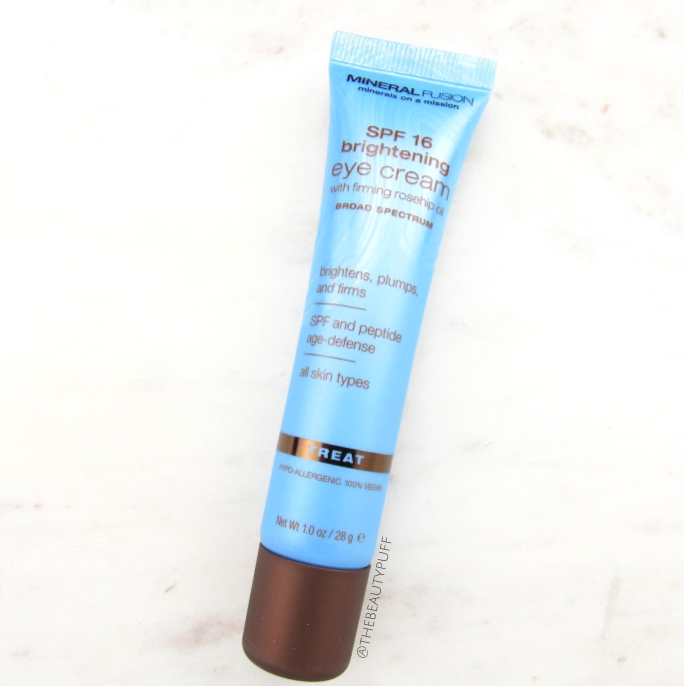 Formula | I love how hydrating, yet light-weight this eye cream is. It keeps my under-eye area moisturized without creasing or affecting my makeup application. It does have a white tint but blends out to a sheer finish that's completely undetectable. I like wearing this eye cream on its own on my no-makeup days as well. Mica helps to reflect light and keep the under-eye area looking refreshed. I love how my skin stays hydrated, protected, and illuminated all in one step! The Mineral Fusion Brightening Eye Cream is free of parabens, phthalates, and artificial colors. It is also gluten and cruelty-free. Shop below on the Mineral Fusion website!